What is common with Chanel, Coty and Davidoff? Nothing, one would tend to say, as they have different fragrances and positioning. But very few know that some essential ingredients that make up most of the famous perfume brands come from Yunnan, in China. Though the province is still home to many aromatic treasures, it seems to be fast losing its edge in the global markets as rampant price wars among domestic suppliers and failure to embrace modern manufacturing techniques are fast eroding the profit margins of companies. Situated in the southwestern subtropical zone of China, Yunnan is home to more than 400 species of natural spices. The annual output of geranium essential oil – an important ingredient for perfumes – in Yunnan is about 120 tons and accounts for half of the global trade, according to information provided by the provincial agriculture department. 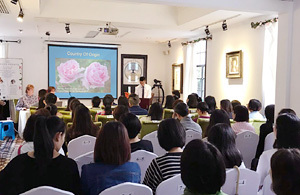 Though the short-term numbers look impressive, considering that exports are increasing and growth is stable, experts express concern that in the long run the prospects are not that rosy as lack of deep processing skills may hinder the further development of the fragrance industry in Yunnan. Feng Rui, director of the China Association of Fragrance Flavor and Cosmetic Industry, says Yunnan’s fragrance industry has seen a steady growth in line with the fast development of the cosmetic, healthcare and pharmaceutical industries, the key industries that use natural oil, fragrance extracts and synthetic chemicals. Industry growth may slow down if local fragrance makers are unable to develop their own skills to meet the demands from key consumers. One good example that many Chinese companies can learn from is Firmenich Aromatics Co Ltd, the world’s second largest manufacturer in the perfume and flavor business. The Geneva -based company has been investing an average more than 10 percent of its returns on technology and product development. Alex Kuo, general manager of Kunming Firmenich Aromatics Co Ltd, says the privately owned Swiss company has done a lot of sensory tests on Chinese consumer preferences to cope up with requirements from those like Procter & Gamble, Unilever and L’Oreal. “The company will step up R&D investments in the next five years to keep pace with the competition and also find ways to gain a competitive edge in the market,” Kuo says. Santo Akirako, general manager of the Yunnan Tsubaki project at Shiseido China Research Center, also stresses on the need for further R&D in the industry. “Our company has been spending millions of dollars on the Yunnan Tsubaki project every year, aiming to grow and extract fragrances from the camellia flowering plant,” he says. “We are extremely interested in Yunnan’s fragrances, especially camellia, and we will further enhance our scientific research investments.” The Japanese cosmetics company has so far spent 90 million Yuan to set up a research center in 2001 for projects such as camellia oil used largely in its popular Tsubaki shampoos. To move up the value chain, other Chinese companies are also making efforts by introducing foreign species of fragrances in Yunnan to meet the demand of perfume houses. Kunming Asia Perfumer Co Ltd, among the few Chinese companies with profit margins of more than 30 percent, introduced a delicate rose species named cabbage roses from France five years ago. The extracts of the flower are widely used in perfumes and cosmetics, and cost upwards of 50,000 Yuan per kg. Lin Chengjie, president of the company, says a strong sense for the preferred fragrances by perfume houses is also very important. “Just like in the fashion industry, perfume companies also keep changing their fragrance preferences. So it’s very important to gauge the trends and be in a state of constant preparedness,” he says. 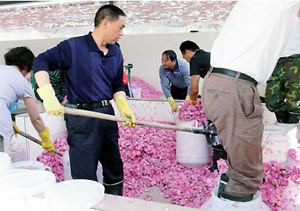 Lin’s company produced 3,000 kg of rose oil in 2011 and the entire stock fetched good prices in the international markets. “We have the advantage of cheap labor and larger farms,” he says. However, most of these things are easier said than done. Lin himself says that he is worried over the growing importance being accorded to other cash crops like coffee. 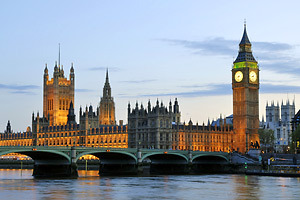 “The local government is more keen on growing the GDP,” he says. “Since the fragrance industry is still in its infancy, we can expect very little support from the government.” The next step, Lin says, is to put more money in breeding new species and launching products like natural oil, soaps and other aromatic products. “If we are able to bridge the upstream and downstream industrial chains, it would help the companies gain autonomy and control over technologies and develop standardized production techniques,” he says. In 2010, Yunnan's fragrance manufacturers exported $105 million (80 million Euros) worth of natural oils and fragrances of synthetic chemicals, up 20 percent from a year earlier. 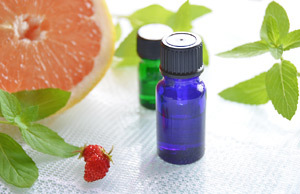 This accounted for more than half of the $239 million revenue earned by the province's flavor and fragrance industry, a 15 percent growth over the previous year, according to the China Association of Fragrance Flavor and Cosmetic Industry. Most of these exports were to destinations like the United States, Europe, India and the Middle East. The volume of rose oil production in the world is 10 tons each year, while the actual demand is about 30 tons per year, leaving a big gap between demand and production, according to the China Association of Fragrance Flavor and Cosmetic Industry.